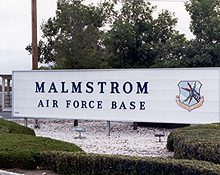 Currently Malmstrom is home to 150 Minuteman III ICBMs, 50 in each of 3 squadrons, the 10th, the 12th, and the 490th. A detailed life extension program is under way to keep the missiles safe, secure, and reliable well into the 21st Century. Since the first B-17 landed here, Malmstrom has had a variety of missions. The first Minuteman ICBM arrived on base by rail July 23, 1962. Later that year the missiles assigned to the nations first Minuteman ICBM wing would play a major role in the Cuban Missile Crisis.